Duro Felguera (DF) specializes in delivering high quality turnkey projects in the fields of mineral processing and material handling. With over 150 years’ experience and an extensive list of global references, DF is capable of developing all stages of a project, from feasibility and engineering studies to start-up and operation of the EPC installations DF delivers. DF is headquartered in Northern Spain and has been listed on the Madrid stock exchange since 1905. In recent years, DF has focused on the international market, taking advantage of its worldwide presence while maintaining its competitive price level. Three new subsidiaries have recently been opened in key areas of the world to take care of new clients and markets: the Middle East, Indonesia and Australia. Duro Felguera Australia Pty Ltd is DF’s Australian registered entity. The company was initially established in 2013 to deliver the Roy Hill project, which is now in the final stages of execution. The Australian entity is now also focused on supplying mineral processing and material handling solutions to mining companies on a turnkey basis. In addition, the Australian DF entity has an important role in assisting DF projects in other parts of the world with an Australian interest. It was based on these merits that in August 2013 DF was awarded a $1.47 billion EPC (engineering, procurement and construction) contract for the process plant and stockyards (mine and port) for the Roy Hill iron ore project. Since then DF has been instrumental in the delivery and execution of the project. The purpose-built process plant for Roy Hill, located 115km north of Newman in Western Australia, is world class and will utilize low risk, proven technology to process 55mtpa (million tonnes per annum) of iron ore. The process plant uses a wet processing and beneficiating model, since approximately 70% of the ore is below the water table, which would be difficult to handle in a dry crushing and screening process. At the mine stockyard, two stackers will stack lump and fines ore at a rate of 5,600tph (tonnes per hour). A bucketwheel reclaimer capable of handling 16,700tph will transfer ore to the train load out facility that can load a 232 ore wagon train in 160 minutes. The train load out uses state-of-the-art technology and is controlled from the Roy Hill Remote Operations Centre (ROC) in Perth. Once at the port stockyard in Port Hedland, 344km away, the trains are unloaded using a 12,900tph rotary car dumper, which tips two ore cars at a time in 88-second cycles. Ore is then distributed via four conveyors, which can directly feed either of the two 14,500tph ROC controlled rail mounted stackers, or a lump re-screening plant and out-loading conveyor, bypassing the stockpiles to be directly loaded onto a ship. 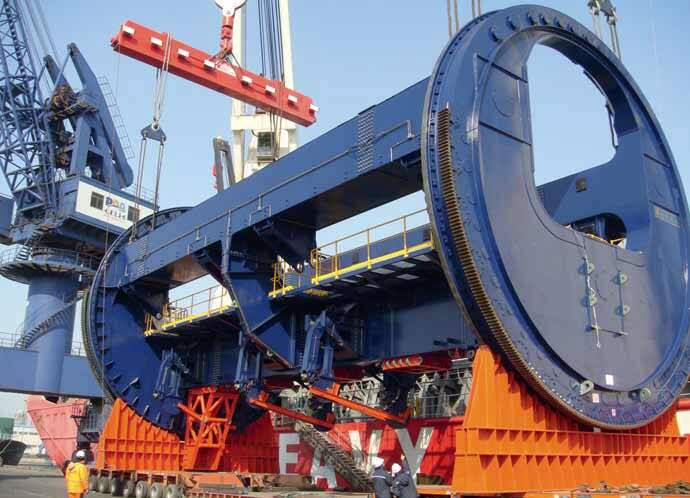 If not fed direct to a ship, ore will be reclaimed by a 16,700tph bucketwheel reclaimer before being conveyed 3.6km to an 800m- long berth and a 12,700tph shiploader. The mine and port stockyards have been carefully designed and modelled to deliver the required capacity and maintain product quality to ensure that Roy Hill is able to achieve its 55mtpa capacity with a high level of confidence. Both at the mine and port, regular sampling of the ore is conducted in fully automated laboratories to ensure strict quality consistency is maintained. All major equipment has been engineered, procured and supplied.All nine material handling machines were fully pre- assembled and test run prior to being shipped using heavy lift vessels. The focus is thus now on the construction and final stages of the project. The Roy Hill project has proved once again that experience, talent, quality and the capacity to adapt to market changes and fluctuations is what has made DF a company of international repute in the highly regarded field of turnkey projects.